As you get better in the English language and grammar, you will come to a point where things will get more difficult. Finding out the differences between pronouns and adjectives is one of those. Learning how to tell both of these apart can be tricky. Possessives can pose a real problem for most students and people who use the English language in general. 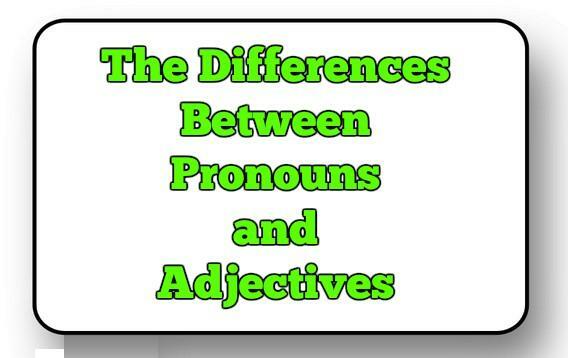 Pronouns and adjectives are very similar and often cause some issues for anyone. Telling them apart can help you become a better English writer, student and overall English language user. Pronouns can pose a problem for people since there are a few of them. You have pronouns, possessive pronouns and demonstrative pronouns, among others. The best way to think of pronouns is that it lets you talk or refer about a thing or an individual without the need to keep repeating the same thing. 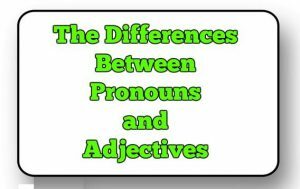 Pronouns are noun phrases or a word that can function by itself. This or that are perfect examples of pronouns. So are which or whose. The same goes for he, his, I, you, etc. Pronouns are used when you are referring to something or someone else in the conversation. There are also possessive pronouns as well as possessive adjectives. Some of these would be your, yours, mine, my, their, theirs, etc. Use pronouns when you are trying to rename the subject without having to repeat their names or the same thing. Pronouns can be very helpful since they can assist you in avoiding using the same name. Example – Pamela did not eat her cereal since she was on a diet and she wants to lose weight. Without the pronouns you would have to replace them and the sentence would sound like this – Pamela did not eat her cereal because Pamela was on a diet and Pamela wants to lose weight. While the sentences are both grammatically correct, they don’t flow or sound as good without the pronouns in place of a person’s name. Hector had to miss the meeting because he could not find his paperwork. Amanda and I are going on vacation. We will have a lot of fun. Jason told me that he could not go with us. These muffins are delicious and I want some more. Please tell me which is worse, school or work? Michael kept staring at himself in the mirror. That is the way John speaks when he gets angry. Maria took her car to the mechanic because she was worried about the noise it was making. Keep in mind that just like pronouns, there are several different types of adjectives. There are descriptive, possessive, demonstrative and interrogative adjectives. A tip to always remember is that you never use an apostrophe with possessive adjectives! These socks are new and they are mine. Damaris gave those kids some cookies. Those old newspaper are just wasting space. We want some of those hats and these shirts.